Patrick Ness's #1 New York Times bestseller now in a movie tie-in version with a striking new cover. The monster in Conor's backyard is not the one he's been expecting — the one from the nightmare he's had every night since his mother started her treatments. This monster is ancient. And wild. And it wants something from Conor. It wants the truth. From the final idea of award-winning author Siobhan Dowd—whose premature death from cancer prevented her from writing it herself—Patrick Ness has spun a haunting and darkly funny novel of mischief, loss, and monsters both real and imagined. This paperback movie tie-in edition includes a book group discussion guide. Patrick Ness is the author of A Monster Calls, More Than This, The Rest of Us Just Live Here, and the critically acclaimed and best-selling Chaos Walking trilogy. He has twice been awarded the prestigious Carnegie Medal and has received numerous other awards, including a Guardian Children's Fiction Prize, a Book Trust Teenage Prize, and a Costa Children's Book Award. Born in Virginia, he lives in London. Siobhan Dowd spent twenty years as a human rights campaigner for PEN and Amnesty International before her first novel, A SWIFT PURE CRY, was published in 2006. She won the Carnegie Medal posthumously in 2009 after her death at the age of forty-seven. Jim Kay studied illustration and worked in the archives of the Tate Gallery and the Kew Royal Botanic Gardens, two experiences that heavily influence his work. 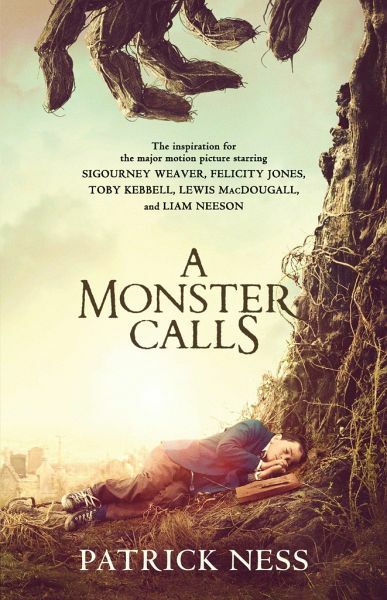 His images for A MONSTER CALLS use everything from beetles to breadboards to create interesting marks and textures. Jim Kay lives in Edinburgh, Scotland.